Renewable Energy Group launched its latest innovation in diesel fuel, trademarked REG Ultra Clean Diesel, at the Advanced Clean Transportation Expo in Long Beach, California, May 1. The fuel is a proprietary blend of biodiesel and renewable diesel. A new study demonstrates that biofuels could be responsible for as much as 21.3 megatons per year of greenhouse gas emission reductions by 2030, approximately 70 percent of the 30-megaton target set by the Canadian government's Clean Fuel Standard. AGQM has released its 2017 quality report from the sampling of biodiesel producers and warehouse operators throughout Germany last year in three sampling campaigns. All samples met or exceeded DIN EN 14214 and even stricter AGQM requirements. 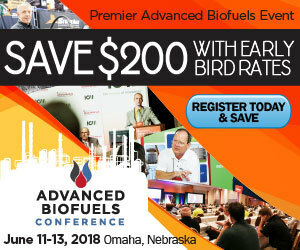 On May 1, Minnesota will again make history, becoming the first to transform almost virtually all of the diesel supply for sale in the state to 20 percent biodiesel. The NBB applauded the shift as an inspiration for a new energy future. North America's top fleets have spoken. Their No. 1 choice for greening fleet operations is the use of biodiesel blends in their diesel vehicles. A new survey indicates 18 percent of fleet participants use biodiesel now, up from 15 percent in 2017. A new food safety program has been developed by the Iowa Biodiesel Board to help biodiesel producers comply with the U.S. government’s Food Safety Modernization Act, deadlines for which are quickly approaching. The cost range is $3,000 to $6,000. Pennsylvania-based biodiesel producer Lake Erie Biofuels LLC, doing business as Hero BX, recently announced a strategic partnership with Iowa Renewable Energy based in Washington, Iowa, to manufacture and market biodiesel from IRE's Iowa facility. On April 25, former Sens. Byron Dorgan, D-North Dakota, and Jim Talent, R-Missouri, who played key roles in developing the RFS, called for Congress to investigate the EPA's recent waivers to major refiners and failure to follow the law. In late April, Missouri soybean farmers alongside processors, distributors and retailers launched the Biodiesel Coalition of Missouri to help ensure a sustainable and stable commercial biodiesel industry for the Show-Me State. Ace Ethanol will be the first ethanol plant to integrate the patented D3MAX technology at its dry-mill ethanol plant in Stanley, Wisconsin. Fagen will build the new facility, also featuring membrane-based ethanol recovery from Whitefox Technologies. Jacob Cha of California was sentenced to more than four years in prison for his part in the Gen-X Energy Group conspiracy to defraud the U.S. government in a RIN and tax credit scheme. After his prison term, Cha will be on court-supervised release. Air Canada saved 160 metric tons of carbon on 22 domestic flights this Earth Day through an innovative biofuel demonstration project at Toronto-Pearson Airport. Under the project, 230,000 liters of biofuel were blended into the airport fuel supply.